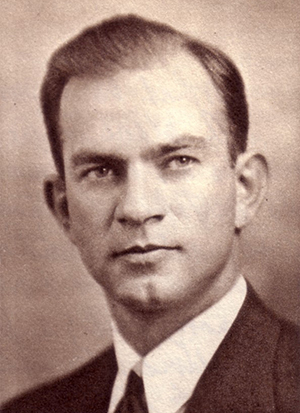 J. William Fulbright is the most well-known graduate of the University of Arkansas, better known for his work as a United States senator than for his short tenure as president of the university. He received his first 16 years of education at the university, first attending the university’s Peabody Training School and then earning his Bachelor of Arts in political science in 1925. He then went to Oxford University as a Rhodes Scholar and earned bachelor’s and master’s degrees while also traveling widely in Europe. Returning to the states in 1931, he attended law school at George Washington University and earned a law degree in 1934. He returned to the University of Arkansas in 1936 to teach law and was appointed president of the university in 1939 after the death of John C. Futrall. Fulbright, only 34, was the youngest head of a college at the time. As president, he continued the programs that Futrall already had in place but he had barely begun to put his own stamp on the university when political fortunes changed. The governor elected in 1940, Homer Adkins, had been opposed by Fulbright’s mother, Roberta Fulbright, editor of the Northwest Arkansas Times. Adkins appointed new trustees who fired Fulbright. Fulbright ran successfully for the U.S. House of Representatives in 1942 and sponsored legislation that led to the United States participation in the United Nations. He then ran successfully for U.S. Senate in 1944, defeating incumbent Hattie Caraway and two other competitors, including his political nemesis, Adkins. As a senator and long-serving chair of the Senate Foreign Relations Committee, Fulbright sponsored legislation that created the Fulbright International Exchange Program, led the effort to censure Sen. Joseph McCarthy, conducted televised hearings on the Vietnam War, advocated détente with the Soviet Union and supported the major international relations efforts of the federal government, including the Truman Doctrine, the Marshall Plan and the formation of the North Atlantic Treaty Organization. He lost office in 1974 but continued to comment and write about international affairs. In 1981, the College of Arts and Sciences was named in honor of Fulbright. In 1993, President Bill Clinton honored him with the Medal of Freedom. Personal: Fulbright was born to Jay and Roberta Waugh Fulbright at Sumner, Mo., on April 9, 1905. He married Elizabeth Kremer Williams in 1932, and they had two daughters. After his wife’s death in 1985, he married Harriet Mayor. Fulbright died Feb. 9, 1995, in Washington and is buried in Evergreen Cemetery at Fayetteville.